Injured Players: Are you the 12th Man or just a Fair Weather Fan? First-year Thomas Lindstrom has 12 career points to his name. The men’s ice hockey team took to the road this weekend, picking up two decisive victories over NESCAC opponents Connecticut College and Tufts. The first win came on Valentine’s day, as the Jeffs handed the Camels a 4-0 loss. Chirs Roll ’17 started the scoring early on the day, netting an unassisted goal 14 minutes into the first period. The goal was the sophomore’s first of the season. The Jeffs maintained momentum and extended their lead to three during the second two minutes of action. Conor Brown ’16 found the back of the net, good for his ninth of the season, at the 4:54 mark. He was assisted by classmate Topher Flanagan and first-year Tyler Granara. Later in the frame, after suffering a tripping penalty, Amherst went on the counter attack, as Brendan Burke ’16 notched an unassisted, short-handed goal to give Amherst a 3-0 lead heading to cap off the second period. Finally, in the final period, Amherst put the final nail in the coffin. Austin Ho ’17 scored thanks to helpers from Andrew Fenwick ’15 and Kevin Ryder ’16. Senior goalie Danny Vitale was credited with the shutout and the win, turning away 23 on target shots. 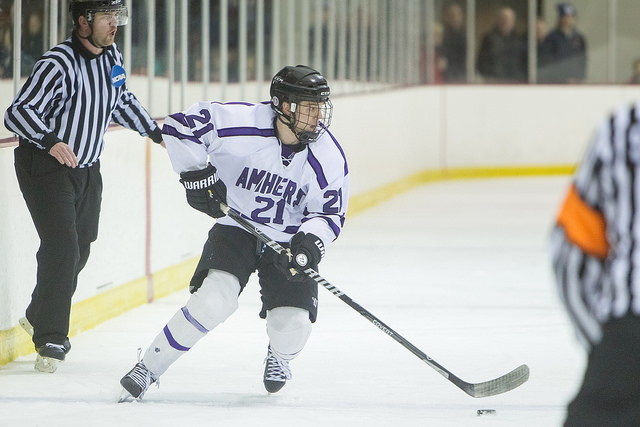 Amherst had a quick turnaround, squaring off with Tufts the following day, Sunday, Feb. 15. The win again proved to be decisive, this time a 3-1 victory in Amherst’s favor. After an uneventful first period of play, the Jeffs struck first in the second stanza. Fenwick netted his fourth goal this season, thanks to passes from Ho and Patrick Arena ’16. Amherst took advantage of a power play opportunity just 2:32 later. Aaron Deutsch ’15 beat the Tufts’ goalie on a shot from the left point, the goal that would be the eventual game winner. David White ’18 and Flanagan were credited with assist on the play. The Jumbos finally found their way on the board in the third period, as Brian Brown utilized a Tufts power play for his 12th goal on the year. However, the Jeffs again provided the final blow, as Flanagan and White were again involved in the play, finding Brown to leave Amherst with their final 3-1 lead. Amherst held a slim 23-22 advantage in shots on the day but capitalized on their opportunities. Vitale had another impressive performance, turning away 21 shots en route to the win. Amherst will face two more NESCAC opponents to round out the regular season. They’ll play host to Middlebury on Friday, Feb. 20 starting at 7 p.m. and then square off in a Saturday matinee against rival Williams, starting at 3 p.m.